So, you want to design, build, and live in community in the most ecologically positive building that can be built? This is the vision that my partner and I had as well, and here’s the story and aspirations that took us on the decade-long course to move-in in July 2016, along with lessons learned along the way. The introduction to cohousing for my partner, Grace H. Kim, and me came in early 1992 with our Washington State University classmates at the Architectural Association in London during a study-abroad program. A Danish architecture professor and author of a book on the history of housing in Scandinavia, Jorn Orum-Nielsen, presented this concept of resident-developed housing, or bofællesskab in Danish. Back in the United States, architects Katie McCamant and Chuck Durrett had recently translated this into the English word “cohousing” in their seminal book, Cohousing: A Contemporary Approach to Housing Ourselves, published just four years prior. During a subsequent month of travel in Europe, I visited a friend’s father’s friend who was a doctor in Milan, Italy. We were there for a week, staying in a five-story historic building that was owned by the doctor’s extended family: he lived in the top-floor apartment with his family, his mother lived on the floor below, his brother below that with his family, a floor was rented out, and he had his doctor’s office on the ground floor. While a similar live/work configuration has occurred for millennia, it was entirely new to me. Fast-forwarding, our experience there was followed by completing our studies, architectural internship and licensure, six years living and working in the heart of Chicago, our return home to Seattle, a year-long certificate program in commercial real estate development for myself, and finally in 2004, the founding of our architecture practice, Schemata Workshop. In 2006, Grace and I began a concerted effort to develop a cohousing project where we would live in community above our architecture studio. Our hope was to find a site in an urban village of Seattle, one that was within walking distance of public transportation, park space, arts and cultural amenities, healthcare, farmers’ market, and grocery stores—criteria that has since been bundled into a concept called a high “walk score.” We were fortunate to connect with a local real estate broker who intently listened to us, did the extensive legwork, and responded with potential sites to consider. Around this time, we became familiar with and deeply appreciated the holistic approach presented by the International Living Futures Institute (ILFI) in their Living Building Challenge 1.0 (LBC). The LBC uses the premise that all buildings should have a positive, regenerative impact on the world, and not simply be “less-bad” than other buildings. We used the LBC as a resource while designing Daybreak Cohousing, and later Dharma Rain Cohousing, both in Portland, Oregon. While Daybreak Cohousing is built and demonstrates the success of thoughtful passive design strategies, neither project achieves the high performance that each community professed as design began. For our cohousing project in Seattle, we would attain as many LBC imperatives as possible: it was the right project, at the right time. Our intended location already met the LBC imperative of “Limits to growth” by considering only greyfield or brownfield sites, in an effort to make better use of land that has already been exploited. This opened up opportunities for previously developed sites—specifically, sites that are not on or adjacent to sensitive ecological habitats, erosion-prone or unstable slopes, nor poor soils, such as the peat or liquefaction areas common around Seattle. The project would contribute to a walkable, pedestrian-oriented neighborhood, one that does not require building any onsite automobile parking. Some future residents were already living car-free and locally; some using public transit and local car-sharing; and others are avid walkers and cyclists. Bicycle use in the building would be encouraged by providing easily accessible, safe, and secure bicycle storage (including tandems, trailers, cargo bikes), and bicycle workspace. Showers and lockers would be provided for commuters in the commercial space. After considering a number of different, scattered locations around Seattle, we focused our pursuits on a two-block-long stretch of geologically stable soil on the edge of the Capitol Hill Urban Village. For site acquisition, we would leverage the rent our architecture practice could pay for office space, as well as that of our personal residence. We found a site that was one-tenth of an acre, with 40 feet of street frontage on one side, and 40 feet of alley frontage opposite. A dilapidated, but still usable, single-story, unreinforced masonry building with 2,400 square feet of interior area had stood there since 1919, and a single-family home for the 20 years prior to that. In mid-2007, we sent a letter of intent to purchase, and earnest money to the owner of the property, while we put our condo up for sale, hoping to use that profit as equity. Real estate sales took a downturn around the same time (eventually falling off completely), and we looked for investors that could make up our equity shortfall for purchasing the site. To get a bank on board to finance the site acquisition, we proposed to keep the two tenants (a tattoo parlor, and an espresso cart) in the existing building and would hold their rents at their current rates. To increase revenue from the site in support of the purchase price, we designed and obtained a construction permit for a two-story, prefabricated component building to be erected on the unused and unbuilt portion of the site, to the east of the existing structure. The new building footprint of 20 feet by 50 feet would extend to the alley and partially cantilever over the existing building. We collaborated with a local fabricator on a self-contained kitchen and bathroom module that would be delivered and simply plugged into the plumbing, electrical, and ventilation systems on each floor of the new building. The building structure would consist of prefabricated three-inch tubular steel frames that are bolted together in the field, with an exterior envelope of insulated metal panels and glass curtainwall outboard of the structure for energy efficiency. The fabricator and general contractor projected a four-month construction period. Within five to 10 years, the temporary building would be disassembled and moved to a new location. This would clear the site for a complete redevelopment of a multi-story, mixed-use building and cohousing community. Course Correction: As we approached construction and mobilization for the drilled concrete pier foundation of the temporary structure, we were also finalizing loan terms for the construction project. Having recently completed the property acquisition with the same lender, we were optimistic, but this was early 2008, and the full impact of the Great Recession was now becoming apparent. Instead of erecting the temporary building, we moved our six-person architecture studio into the former garage of the existing building, with an entrance that took us past the espresso cart, and where a decade earlier “Hot Rod Pinstriping” had occurred, with hand-painted door signage that proclaimed the same. With the property now under our ownership, and a five-year loan term with our outside investors, we settled in to the quiet buzzing of tattoos from the other side of the wall, and the constant aroma of coffee. The unbuilt, prefabricated component building design, in which we invested a lot of research and development time and money—both personally and through the office—received a national award from the EPA for an unbuilt “Lifecycle Building,” but the construction permit and shop drawings still lay in a flat file in the office. Lesson Learned: Find a location for your future community that supports how you want to live, both now and in the future. An urban infill site takes advantage of the myriad of amenities, conveniences, and existing infrastructure to support livability. Be flexible, patient, take one deliberate step at a time, and accept that while some efforts may not come to fruition, they are not necessarily wasted. Everything described above led to acquiring a great site for our future cohousing community. In late 2009, Grace and I restarted offering monthly, local Cohousing 101 sessions (free and open to the public) that would raise awareness of the resident-developed model of an intentional community, and we discovered a variety of levels of interest among attendees. In early 2010, Grace and I announced that we had a site and if the location met expectations, they may be interested in an upcoming meeting to discuss moving forward. A number of families came and went during what we projected at the time would be a four-year development process. For some, there were too many meetings; it was going to take too long to complete; there was no off-site parking; homes were going to be too small and/or too expensive. The group adopted the placeholder name of Capitol Hill Urban Cohousing, or “CHUC” for short. With facilitation help, we wrote and coalesced around a vision and values statement, put up a website, and began design of the building in anticipation of the public meetings required to obtain City land use and building permits. We hired a general contractor (GC) for pre-construction services that included members of the team that had just recently completed construction of the Bullitt Center about six blocks away from our site. They were in the midst of certification as a “Living Building” under the LBC, with required imperatives around net zero energy and water, nontoxic materials, and locally-sourced construction materials, among other criteria. With CHUC, we applied for permitting under the City’s Deep Green Pilot Program, which was based on the LBC, and intended to encourage the construction of high-performance buildings. In exchange for our commitment to a 75 percent reduction in energy and water use over a comparable, code-compliant building, CHUC could receive a height exemption that could be used for an additional story of height. We assembled a skilled design team, and held a kick-off/chartering meeting for the entire design and construction team at the Bullitt Center. With this momentum, we had our required LBC Charrette which brought together the entire team, led by a representative of the ILFI, along with a Technical Assistance Group (TAG) provided by the City that was comprised of local professionals with experience designing high-performance buildings. This day-long workshop and an integrated design process would help ensure the completed building would meet the goals for energy and water efficiency, along with our interest in achieving other “petals” of the LBC. The future cohousing residents were all committed to the highest performing, most environmentally positive building that we could possibly develop. Course Correction: None. The design team was united in pursuit of a building to fully comply with the City’s Deep Green Pilot Program, or better. Lesson Learned: This comprehensive approach to the design and project delivery effort, with the entire design and construction team closely collaborating, can help achieve a collective commitment and support for the vision, and ultimate success of the project. Unlike the speculative projects of this scale (and larger) that most members of the team work on regularly, here we could introduce them to the families that were going to live in the building. Be sure to reach out to the local building department to see what resources they may be able to offer in support of your project. At the outset of design, our priority was for resiliency—the early ’70s British concept of a “long life, loose fit, low-energy” building, and what Stewart Brand in his book, How Buildings Learn, later articulated quite well as a systems approach to building. 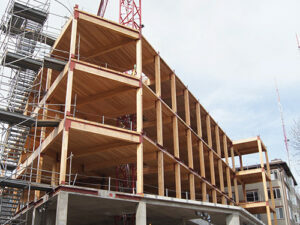 The primary structure would be clearly distinct and positioned in-board from the building envelope. Our design approach was informed by our Seattle experience living in a 1910 warehouse building in the Pike Place Market that had been later converted into housing, and the 1927 warehouse building that was later converted to office space and where we opened our architecture practice. To truly address flexibility for an unknown future, it is necessary to build a structure that would outlast all of the founding families and be a durable framework for future residents to live in community. Everything inside and outside this robust structural frame will eventually be replaced. The structure, however, will remain while exterior cladding deteriorates, window assemblies fail, electrical systems become obsolete, plumbing and mechanical systems are replaced, and interior walls are removed or relocated. In contrast to the temporal nature of all these systems, the primary structure and foundations are intentionally designed and built to remain fully functional for 250+ years. In the interest of longevity, we investigated three different structural framing systems: 1) steel, 2) concrete, and 3) cross-laminated timber (CLT). Each of these could provide long-term flexibility related to interior partitions, and repair and eventual upgrade of building utilities and infrastructure. Due to our urban infill location and building out to the adjacent property lines, a steel frame would require expensive fire protection of all structural members, and we would still need the mass of a concrete deck for acceptable acoustic performance between homes. For a typical cast-in-place concrete building, current post-tensioned (P-T) engineering uses steel tendons to optimize the thickness of concrete and spans. Unfortunately a P-T system has an estimated 75-year lifespan, and we have a recent, local example of a high-rise that was entirely demolished due to early, pervasive failure of steel tendons. To avoid post-tensioning the concrete, we could use a dense web of mild-steel reinforcing, but this results in thicker floors than was our preference. Despite the nearly ideal acoustic and thermal performance of a high-mass concrete structure, we decided against this option due to the energy used in producing the cement, sourcing distance, and post-earthquake performance, assessment, and repair of concrete in our active seismic zone. Instead, we designed the building around a material that had already sequestered atmospheric carbon into trees that was then processed into CLT. 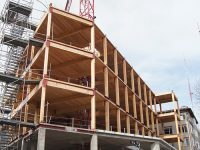 This CLT plank material is highly engineered and permitted under the Heavy Timber section of the building construction code. In addition to exceptional seismic performance, it also offered visible infrastructure and systems, such as surface-mounted electrical conduit, outlets, and light fixtures. Earthbound hold-downs at the exposed ends of CLT panel shear walls would also be visible and could be assessed after an earthquake. All plumbing would be consolidated to a limited number of vertical shafts through the building, with mechanical equipment, ductwork, and fire sprinklers visible and easily accessible within each home. While the Bullitt Center used an in-field, nail-laminated timber deck instead of CLT, our GC brought lessons learned related to fire-ratings and beam-to-column connections that we would also employ. With a CLT structural system, a lightweight-concrete topping slab is poured over a high-performance acoustic mat to provide acceptable sound isolation between homes, without having to suspend an insulated ceiling below the CLT deck and beams. CLT offered the attraction of visible wood ceiling and wall planes, in conjunction with the concrete floor that could be left exposed. Engineered flooring could be laid on top of the concrete for a more finished appearance, at the discretion and expense of the future resident. Course Correction: Pre-construction services with the GC included two rounds of construction cost estimates. After reviewing and cutting everything that we reasonably could from the project, the cost estimate was still substantially higher than our budget could accommodate. The design team then redesigned the building from CLT to a more typical stick-built wood frame, over a first floor podium of mild-steel-reinforced concrete between the commercial space and residences above. A lot of the cost was also in how our selected GC delivered high-quality, well-crafted buildings. This simply required a lot more time and staff, as well as using reliable subcontractors that they could count on. We had to find a more economical GC, and chose one that had just completed an adjacent apartment building and provided a cost estimate that met our budget. Lessons Learned: It is difficult to reconcile aspirations for a great building (one that truly is good for the environment and its residents) and a building whose main goal is to provide for a thriving social network, while connecting residents to light, air, food, nature, and community. Raising more investor equity would not work, due to the high interest we would pay for a loan subordinated to the bank. The future residents had already spent months running “sensitivity analyses” on a wide range of rent and equity scenarios and were using a reasonable principal and interest rate in our proforma. In order to increase the construction budget, we would need more low/no-interest “patient money” from the future resident families, but everyone had already contributed what they could. Time to get to work with what we could count on from the families that were committed to making this happen. LBC required that 100 percent of the project’s energy needs be supplied by on-site renewable energy on a net annual basis, while the Deep Green Pilot Program required a 75 percent reduction of energy use over a conventional building. Our limited site and roof area had space for a 10kW photovoltaic system, which translated into needing to achieve an Energy Use Intensity (EUI) of 16. This low EUI is a challenge in a residential building, primarily due to daily hot water use by residents. To achieve the target EUI, we analyzed and optimized the building envelope using Passivhaus Institut energy strategies. To help ensure an airtight building with sufficient fresh air changes, the same fluid-applied Air and Water Barrier (AWB) refined specifically for and used on the Bullitt Center would be used on our building as well. Daylighting through individual unit configuration, shallow unit depth, window sizes and locations reduces the need for electric lighting. High-efficiency LED light fixtures with occupancy sensors, and efficient, Energy Star-rated appliances will be used throughout the building. Per LBC, no fossil fuels are permitted to serve the building, which also helps ensure indoor air quality by eliminating carbon monoxide output during cooking with natural gas. Cooktops are all electric induction for efficiency, and a central high-efficiency domestic hot water system serves all homes. A heat recovery ventilator (HRV) for each home was explored by the team, but we determined that energy use by the HRVs, and the noise generated, were both unnecessary and that a whole-house exhaust fan with fresh air supplied by window fresh air ports will be sufficient. Highly-insulated, full-height, operable tilt and turn, fiberglass-frame, triple-pane windows would provide for natural convection and night-flushing of the individual homes, taking advantage of the thermal mass of the building. A shallow balcony would extend the full length of the west façade, providing shading of the glass on hot summer days for interior comfort. All common area circulation space is unconditioned to reduce energy use of unoccupied space. The commercial tenant (architect Schemata Workshop for a minimum five-year term) would commit to a maximum wattage allocation under the terms of their lease with the cohousing ownership entity, with a financial penalty if it is exceeded. The office space will use an electric hydronic baseboard at the exterior window wall, with CO2 sensors operating windows for fresh air, which combine with bathroom exhaust fans to provide for necessary fresh air changes. Course Correction: Due to construction costs, the rooftop PV array was not installed. As unit layouts were being refined, families moving into the west-facing homes stated a preference for interior space instead of exterior balconies. We omitted those balconies and designed an exterior sun-shading screen system that could slide out of view, but these screens were outside of the budget and omitted as well. Triple-pane fiberglass windows were too expensive to use throughout the building, and were installed only at the east façade of the sole residence with an exterior balcony overlooking the alley. Insulated, double-pane, vinyl windows are used elsewhere, while cost dictated a minimally code-compliant, fire-rated, insulated entry door and frame to each home. Lesson Learned: A 10-year cost/benefit analysis of a variety of upgrades beyond energy code minimum provided guidance to the design team, with a final designed EUI of 31. We determined that an additional layer of insulation outboard of the wall sheathing that would substantially reduce thermal bridging, along with a continuous fluid-applied AWB, were low-cost options for a high-performance building envelope. Be sure, however, to find a qualified applicator that understands and can work with the specific AWB material selected. It’s most practical to invest in cutting energy demand with a more efficient building, e.g., better windows and exterior doors, an efficient alternative to electric resistance heating, and electric induction cooktops in all homes, before considering energy production. LBC required 100 percent of the project’s water needs be supplied with captured precipitation or other natural closed-loop water systems that account for downstream ecosystem impacts, in addition to onsite blackwater (sewage) treatment. The Deep Green Pilot Program required a vaguely defined 75 percent reduction in potable water usage and outflow compared to a conventional building, with no requirement for blackwater treatment. Due to our limited site area, high residential water demand, and the rooftop farm, we would need to also collect stormwater from the adjacent building to the north, which would supply a 20,000 gallon cistern under the street-level commercial space. Historically dry summers would be insufficient to refill the cistern, but rainwater would be used year-round for toilet flushing, clothes washing, and irrigation in order to minimize negative downstream ecosystem impacts. The lower roof with farm would discharge contaminated water, not available for use in the building, while the upper roof with PV array, along with water collection from the adjacent building rooftop would charge the cistern. Course Correction: A secondary water supply system of “purple pipe,” used solely for treated rainwater distribution to each home, along with the additional cost of excavation for the cistern, proved to be outside of the construction budget. At this point, it became apparent that we would not be able to achieve the City’s minimum requirements under the Deep Green Pilot, and would need to back out of the program. This also translated into building only nine homes, versus the 12 anticipated with the height exemption allowed under the Deep Green Pilot program. Lessons Learned: A multi-family apartment building is inherently challenging for water usage, in comparison to other buildings that have more commonly pursued the LBC. Residents shower, wash clothes, and have dishwashers. We would still have a central domestic hot water system that efficiently routes hot water to each home, along with high-efficiency plumbing fixtures. Our community made a commitment to integrating opportunities for and being stewards of urban agriculture, while making a positive contribution to a local food network. Toward that goal, we partnered with and received some minor financial support from both a local private university and a public college. A farm-to-table restaurant a half-mile south contracted with an urban farmer to oversee a majority of the farm that was dedicated to their food selection, production, and distribution. Staff from the restaurant can pick produce in the morning, and serve it in the restaurant that evening. At the same time, residents of the building will have access to designated areas for growing produce used in common meal preparation as well. Course Correction: While we originally envisioned gardens on both roof levels, we omitted the elevator stop to the uppermost roof, which prohibited a farming use due to accessibility requirements of the building code. Construction costs were reduced by not reinforcing the upper roof for the heavy soil loading required by a garden. The upper roof is, however, designed to support a future PV array with conduit provided to the basement electrical room. Lesson Learned: Be adaptable, while maintaining and finding a way to achieve the vision. Prospective residents who had expressed a commitment during early design to manage the farm instead moved to an actual farm, so the partnership with a restaurant was one way that allowed the farm to be used to its full potential. Installation of a PV array can still occur in the future, and after additional energy efficiency upgrades, such as more efficient central hot water heaters, or cooktops, or wall heaters in homes. As described in the LBC, the project is designed to create human-scaled rather than automobile-scaled places, so that the experience brings out the best in humanity and promotes culture and interaction. Homes are organized such that there is a public-to-private gradient in the lives of residents, with kitchens immediately adjacent to common areas, and more privacy and seclusion offered further inside each home. The courtyard provides a human-scaled, intimate, vertical urban space that can be personalized, effectively serving as the central circulation path seen in other ground-related, suburban or rural cohousing communities. Salvaged brick from the original building paves a portion of the entry hall, and a prominent glass tile mosaic designed by a resident, with tiles set by all residents including the children, is a great reminder of the success of participation in building community. The Common House, located on the second floor and directly adjacent to the outdoor patio, functions as a hearth/heart of the community and provides for communal meal preparation and dining three times a week, as well as informal gatherings, an impromptu “third place,” celebrations, and fostering of community. Community spaces allow residents of the building to live larger than their compact and efficient homes would suggest. While aspirations were ambitious and paths toward a high-performance building were clear and exhaustively pursued during design, the single most significant goal was to live in community. With only 160 built cohousing communities in North America, adding one more to the list should be considered quite an accomplishment in itself. All nine families moved into the building over a three-day period in June 2016 to occupy six homes at 850 square feet each, two at 1,100 square feet, and one at 1,300 square feet. Common meals occur three times per week, and the building feels more lived-in every day. As with any construction project, we still have some challenges with warranty issues and maintenance to deal with, but staying focused made it all a reality. Be open to adapting the process in order to overcome the inevitable challenges along the way to be sure that future residents are all engaged in and committed to the project. Groups that are forming an intentional community need to accomplish the business of real estate development, while at the same time building community and social capital with each other. While participation by residents will fluctuate over the course of each of our lives, we will adapt, and living in community has proven to be well worth our collective effort. Michael Mariano is a principal and architect at Schemata Workshop, Inc. in Seattle, Washington, where his partner/spouse and their daughter live in the cohousing community above their office. Michael also co-chairs the Capitol Hill Ecodistrict, which anticipates certification in 2018 as one of the first-ever neighborhoods under the strict and holistic EcoDistricts protocol. CHUC is located at the geographic center of Capitol Hill and its population of 30,000 residents, and serves as the epicenter of their personal and professional efforts to improve livability while building community (schemataworkshop.com). Brand, Stewart. How Buildings Learn: What Happens After They’re Built. Viking Press, 1994. Leupen, Bernard. Frame and Generic Space. 010 Publishers, 2006.